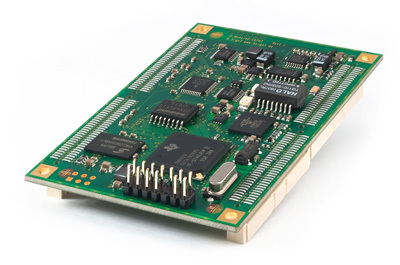 The D.Module2.C6747 is a TMS320C6747 DSP module offering a versatile embedded DSP single board solution - for developers requiring an integrated floating point processor with extensive communications and I/O capabilities. It is primarily designed for OEM developers looking to reduce time to market while lowering total cost. It can be used as a stand-alone system, or as a mezzanine daughtercard embedded within a larger system or board design. The D.Module.C6747 design incorporates a floating point TMS320C6747 DSP Processor, with SDRAM, FLASH ROM, USB 2.0, USB 1.1 with host capability, two UARTS with RS232 and RS422 line drivers, a 100Base-T Ethernet Controller with a 2-port switch, and a 100MHz peripheral bus interface. A versatile set of peripherals is available to attach sensors and actuators: two quadrature decoders, up to six high resolution PWM channels, three capture modules, two timers, I²C, SPI, and 16 GPIO signals. If mass storage is required, an optional NAND Flash or a Multi-Media/SD Card can be attached to the module. A Real-Time Clock is provided to add timestamps and/or trigger long-term data acquisitions. Data converters can be connected serially via two McASP ports or via the parallel 16/32-bit expansion bus. The D.Module2.C6747 is a low power device: the typical operating power is just 2.5W. Flexible power and clock control features allow to reduce the power consumption even further.